Red tip shrub, (Photinia x fraseri), gets its name from the flush of showy, bright red growth that emerges on the tips of the evergreen branches in spring. After a few weeks, the red leaves turn a glossy, dark green color. Clusters of tiny white flowers also appear in spring. In autumn, red tip shrubs display tiny small red berries. 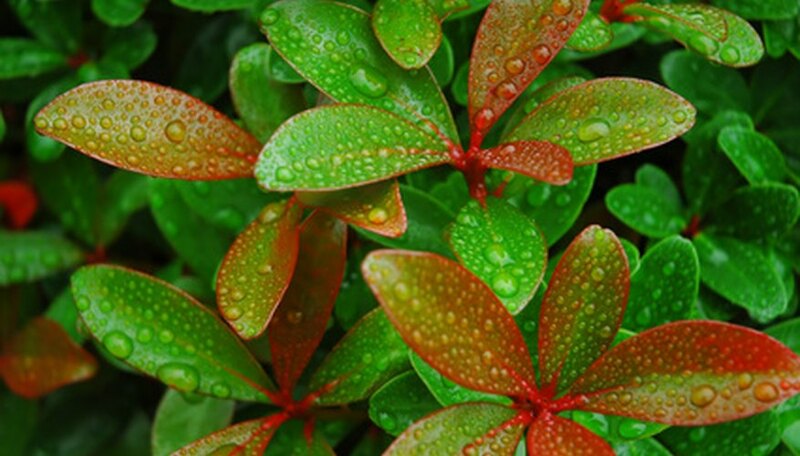 Propagate red tip shrubs with hardwood cuttings in early winter. Clean a pair of pruning shears with a mixture of 9 parts water and 1 part household bleach. Sharpen the pruning shears. Dull blades damage the wood and prevent rooting from taking place. Cut several long, straight shoots about the diameter of a pencil, but no larger than your little finger. Take the cuttings from the center of the red tip shrub, which will root more easily than shoots from other parts of the shrub. Keep the shoots in a shady, cool spot until you're ready to root them. Cut the shoots into smaller cuttings. Cut the end of the shoot that was nearest the ground at a 45-degree angle, and cut the top of the shoot straight across. Each cutting should be approximately 6 inches long, and must have three or four leaf nodes, which is where a leaf or bud emerges from the shoot. Strip the leaves from the bottom, or angled, end of each cutting. Moisten the angle end of the cutting. Dip the end, up to about an inch, in powdered rooting hormone. Fill a 1-gallon container with a mixture of half clean garden soil and half perlite, sand or well-rotted sawdust. Any container will work, as long as it has good bottom drainage. Plant the cutting in the container with the angled ends down, leaving one or two leaf nodes above the soil. Several cuttings can be planted in the same 1-gallon container. Place the containers outdoors in a sheltered area where they will be protected from cold wind, freezing temperatures and hot sunlight. Cover the containers with plastic, and mist them at least once every day. Or, store the containers indoors in a cool, humid room. Keep the red leaf shrub cuttings in the container through the rest of winter. Transplant the red tip shrub cuttings into the garden in spring.